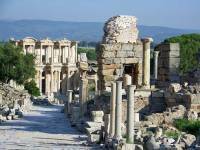 You get to Ephesus through the Turkish town of Kusadasi. About 100,000 people there. We arrived by cruise ship for our Ephesus Shore excursion. You can also fly in to the nearest major international airport in Izmir. 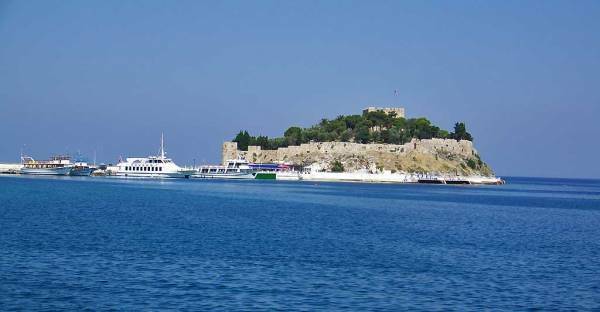 Another option to get to Kusadasi & Ephesus is on regular ferry service from Samos, Greece. 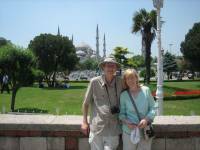 If you book a land tour of Turkey, you will arrive by bus or rail. 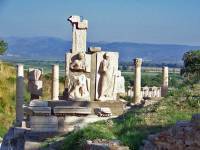 An Ephesus Shore Excursion takes about a half day or less from Kusadasi. 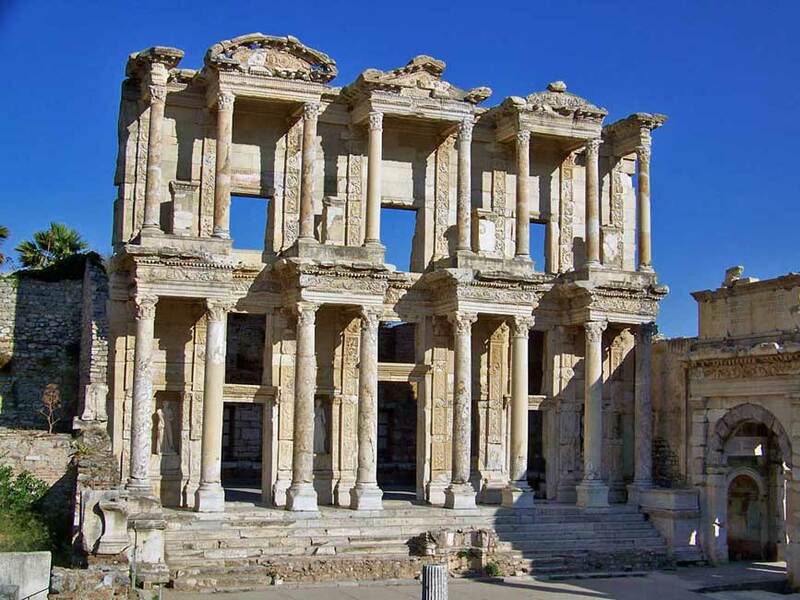 Ephesus used to located on the Aegean Sea, but changes in geology have cause the ancient ruins to be about 6 miles inland now. 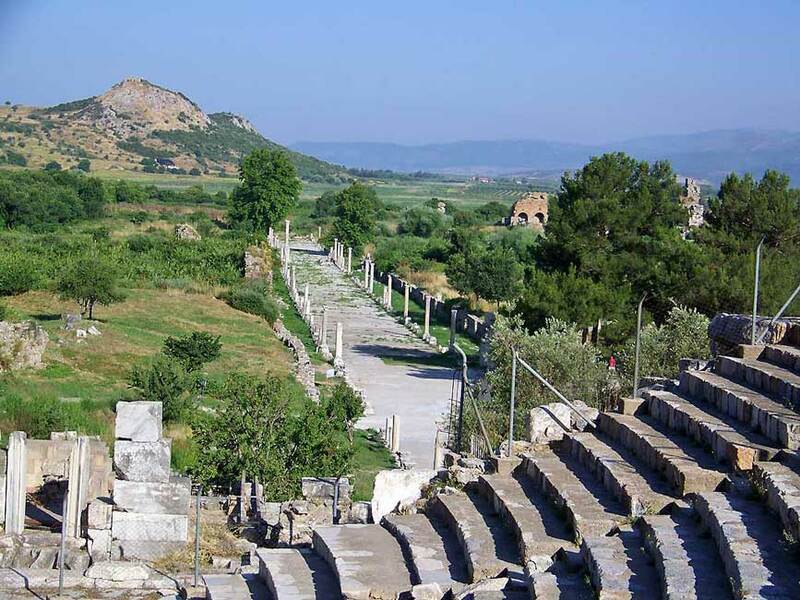 The bus ride from Kusadasi to the ancient ruins of Ephesus takes about half an hour. After visiting Ephesus, spend some time in the modern port town of Kusadasi. Stroll the waterfront promenade and view the old city walls. Enjoy the views of Pigeon Island from a restaurant in the harbor or cab out the causeway to Pigeon Island for a swim. The summer months from June – August can be very hot at Ephesus, but the Aegean Sea helps to reduce the heat. Average highs in summer reach 91 F (33 C) while average lows at that time are about 70 F (21 C). In the winter months of January – February, average highs are about 55 F (13 C) while average lows at that time are about 39 F (4 C). The summer months are dry. Spring and fall are ideal times to visit Ephesus. We visited in the first week of June. The skies were clear and the temperatures during our early morning visit were perfect. 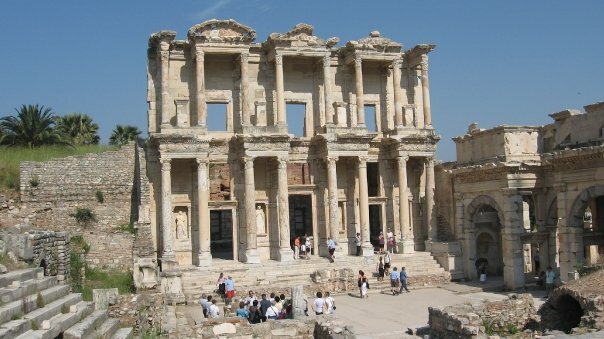 I think early June is the best time of year to visit Ephesus. 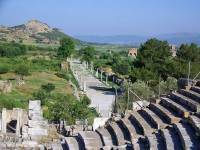 Our Ephesus Shore Excursion started with a half hour bus ride from Kusadasi. We purchased the shore excursion directly from the cruise ship. 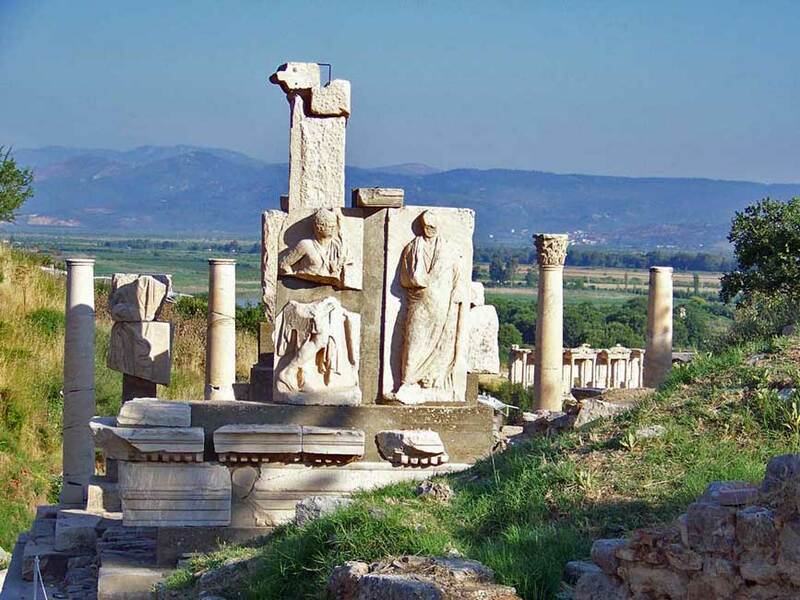 The Greeks and then the Roman built the ancient site of Ehpesus. The famous Roman, Marc Anthony, and the Queen of Egypt, Cleopatra, had their honeymoon in Ephesus. When Marc Anthony and Cleopatra visited Ephesus, it was a sea port, but the ruins are now miles inland. 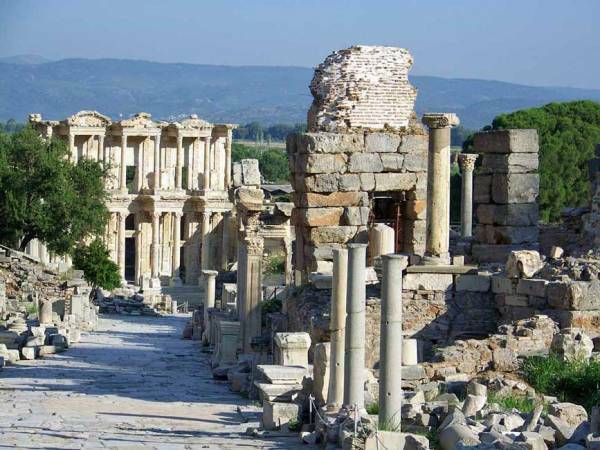 The long ruined street you see at Ephesus was the harbor promenade when Marc Anthony and Cleopatra famously walked there. We were the first tourist group to arrive on an Ephesus Shore Excursion on the morning of our visit. At the entrance, our tour guide started a long lecture while other groups arrived and passed us into the ruins. I quickly realized that if we left our tour and walked quickly, we could be the first ones to arrive at the Library of Celsus and the amphitheater. We left our tour behind and passed the two tour groups that had gotten ahead of us. Suddenly we had Ephesus all to ourselves. 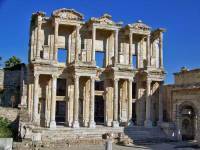 The large two story Library of Celsus and the famous walkway taken by Cleopatra and Mark Antony belonged only to us. We went into the amphitheater and climbed to the top. We sat in the amphitheater alone for about 10 minutes in solitude, listening to the doves and thinking about how Marc Anthony and Cleopatra would have once been in view below us. 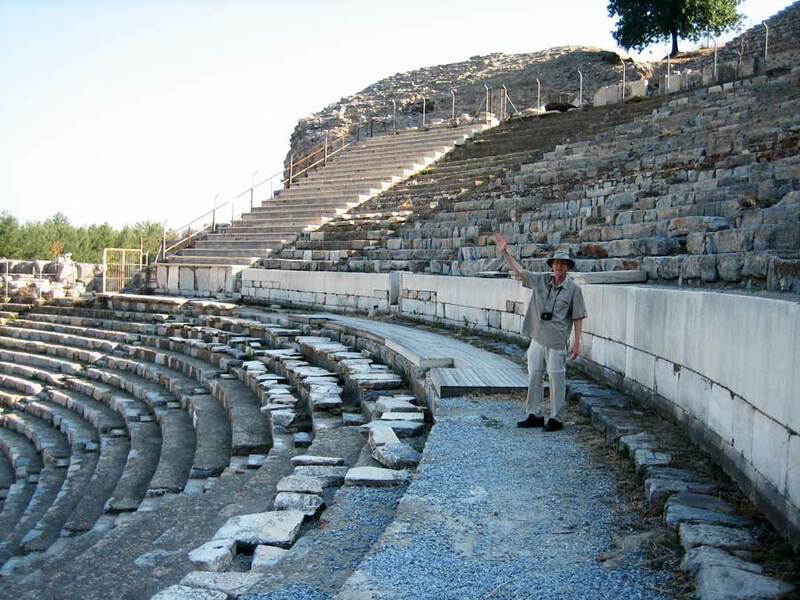 Having Ephesus all to ourselves was an amazing moment that most Ephesus Shore Excursions don’t get to experience. We felt very lucky, but our tour guide certainly wasn’t impressed with us.